I was looking for the thread "Marvel Movies" and I can't find it. Am I losing my mind or has it been removed? Anyway, I found this in my Net wanderings. Knock yourselves out! I am happy to say that your mind is perfectly fine, Hikari. Carol kindly volunteered to split the thread into a discussion thread and a picture thread, since in its current form it was becoming rather unwieldy. I was lost too. Sorry about the annoyance, I honestly didn’t think anyone else even noticed or cared, or I would have toned it down, lol. It’s been so quiet around here. Not a problem, Artemis! You've posted a lot of interesting stuff (even though I don't really understand most of it, having seen only a handful of these movies). I just figured it'd be easier for people to find what they're looking for (pictures or discussion) if there were two separate threads -- especially as I am told there are a bunch of new movies coming along soon. And sorry for the confusion, everyone! I just finished the splitting, and was gonna post an explanatory note on each of them (honest! ), but I see that you guys have beat me to it. Added: And I've moved us all to the discussion thread. The pictures thread is here. Some of those look more like horror movies than superhero movies. Yeah, I’m seeing a trend. “Brightburn” is basically an alternate universe “What if Superman were evil?” story. I remember hearing or reading somewhere that it’s based on a comic, but I can’t recall where I got that information, or the details. Maybe I’ll do a search later. 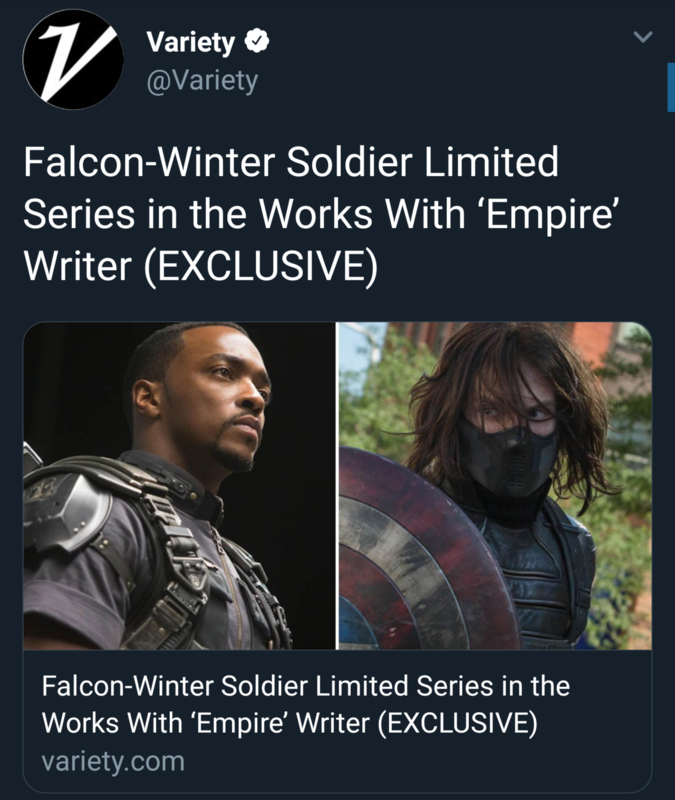 "Variety has learned exclusively that Malcolm Spellman has been tapped to write a series featuring the two superheroes, which is currently in development at the streamer. It is the first of the proposed Marvel limited series to find a writer. News of the development comes after Varietyexclusively reported that Marvel and Disney were prepping multiple limited series centered on characters from the Marvel Cinematic Universe who had yet to appear in their own standalone films. At that time, it was reported that characters like Loki and Scarlet Witch would also be the subject of their own limited series. The series are expected to be six to eight episodes. I wonder if Clint Barton (Hawkeye) would ever get a series. I’d like to see more of him. With the Black Widow movie on its way here eventually, I suppose it’s at least feasible; though I don’t know what kind of interest Jeremy Renner might have in the idea, or what Marvel/Disney thinks the audience demand would be. I’m a bit of an archery nerd, so I might be biased. Are the TV series going to star the same actors as the movies? I’m off to see “Captain Marvel”. I shall return with a report. Did you delete that post, Artemis? I recall reading it, but don't see any sign of it now. It’s in the Recently Watched Movies thread.